This Glove looks way too big. So we try next size smaller? Measuring with a shell a half size smaller, in this case size 0, this one does not accommodate the heels of the hoof. This is better, but still not fitting right, no ‘V’ is displayed, where the hoof pick points, we see a gap. 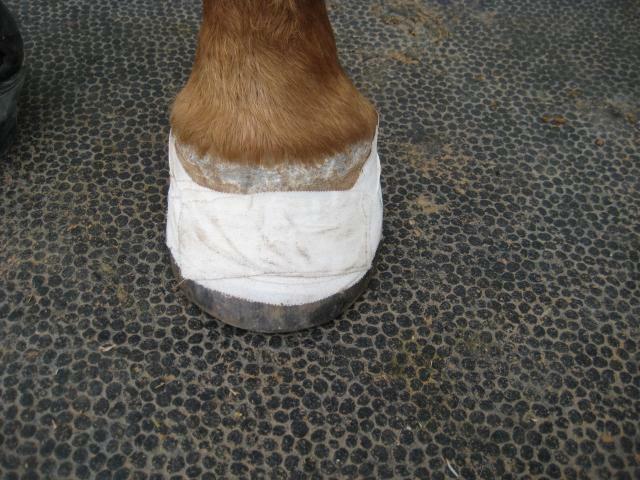 Looking at the naked trimmed hoof, we can see some serious dorsal hoof wall distortion. The dorsal hoof wall is already dressed back to the white line. 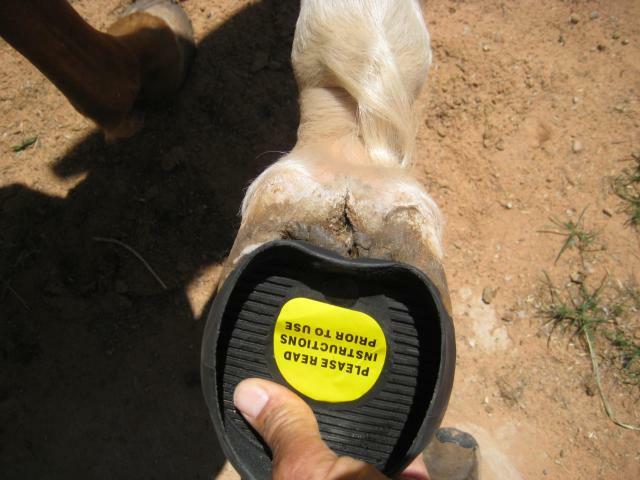 This horse has a smaller foot on the right front, caused by genetics. Furthermore, this horse always pressures the dorsal hoof wall when standing, thus aggravating the distortion. 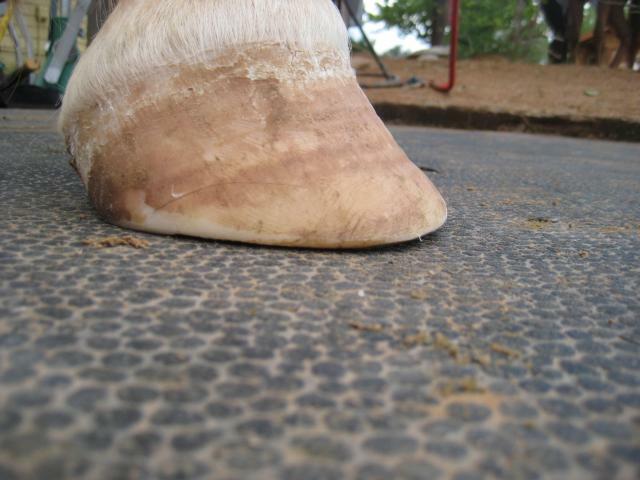 That hoof does not have a stretched or torn laminae. 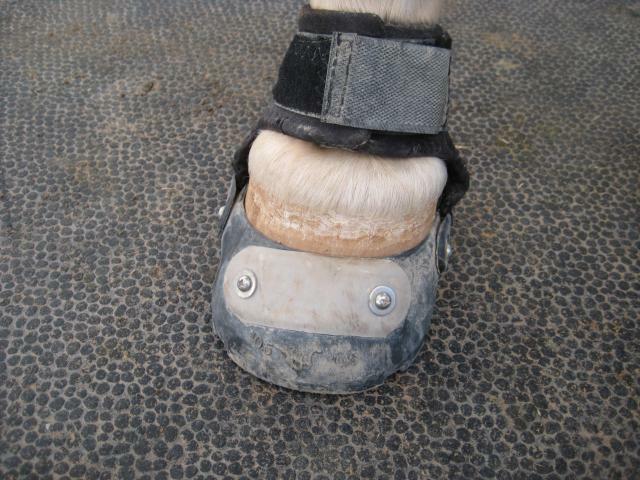 The same size boot, 0.5, that had that huge gap in the front, now encloses the hoof wall very nicely. 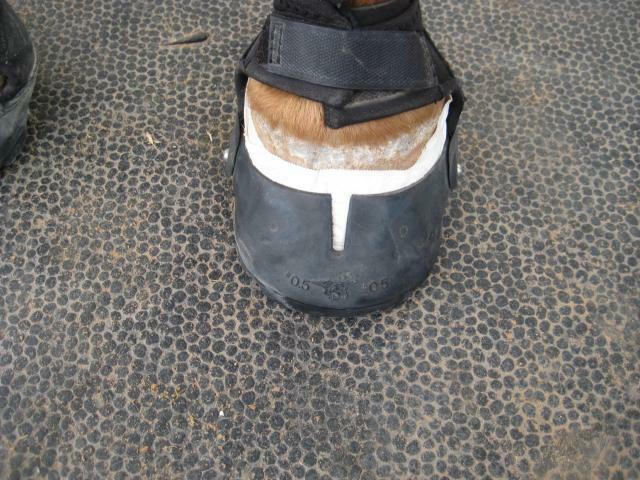 For hoof wall distortions like this one, when even your best efforts of horse hoof trimming and natural hoof trimming don’t get you a hoof with straight sides, a Easyboot Glove powerstrap comes in very handy. They come in many colors, by the way, not just grey. 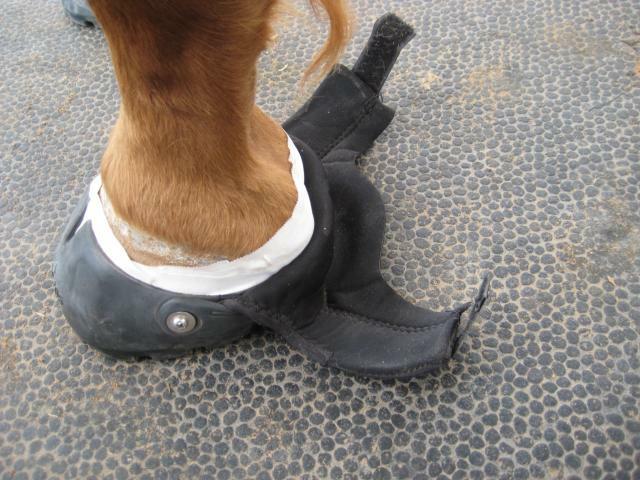 Natural hoof care and barefoot trimming will not always get you the desired results. Straight hoof walls are the goal, but not always achievable. 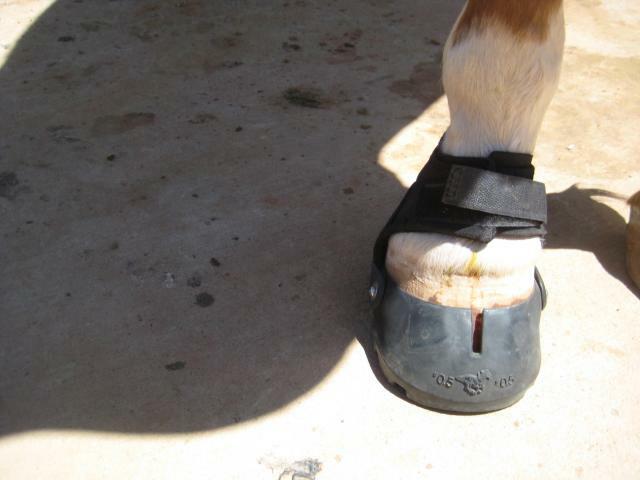 The hoof walls are straight all the way around, there are not even any flares that need to get dressed back; but to give the Glove a little tighter fit and prevent sand, dust and/or water to enter the boot, we use athletic tape and wrap it around the hoof. You can wrap the tape all the way across the heel bulbs. 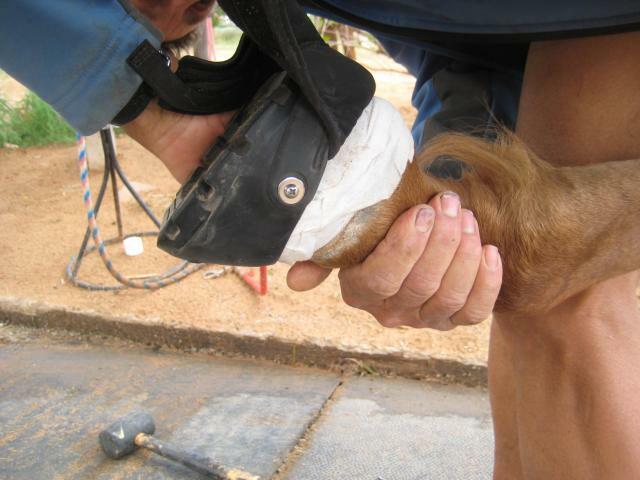 When then applying the Easyboot Glove, it helps if you have a hoof pick to ease the shell onto the hoof. If you just push it on, the tape can bulge up and the boot then won’t fit right. When using the tape, always use the rubber mallet to seat the boot. The tape will add a lot of friction. While setting it down, gently pull on the gaiters, so you do not have any creases in the fabric and the heel bulb sits nicely in the gaiter pocket. Close the velcro straps snugly. 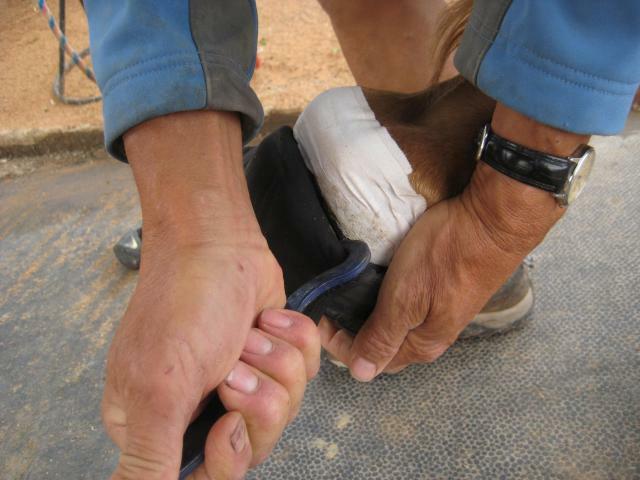 Now we have a tight fitting Glove, displaying a nice V. If one needs an even tighter fit, or you just happen to be between sizes, one can wrap several layers of tape around the hoof wall. 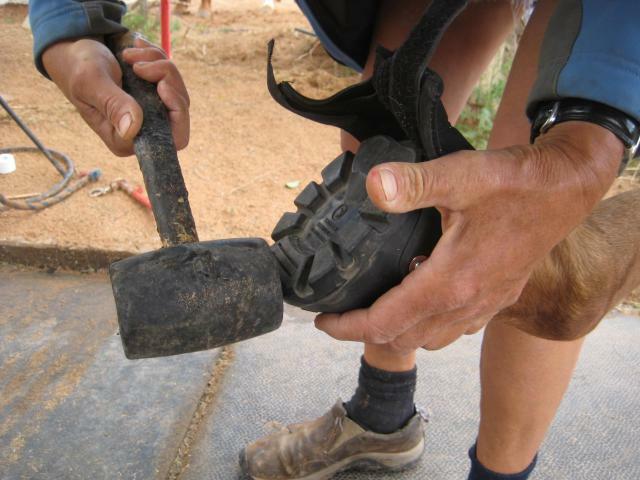 You want to see a V.
Before removing a boot, first lower the gaiter all the way down. Next, gently break the friction created by the tape by loosening the shell at both sides at the quarters. Never pull the boot off by the gaiter. 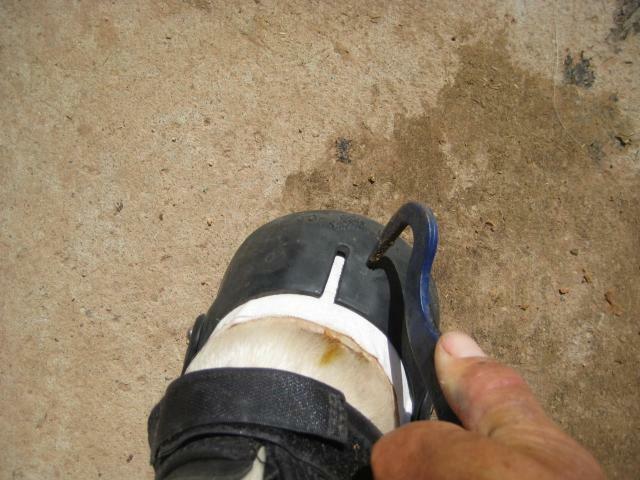 Not only will you tear it, but you might cause damage to the horses fetlock. 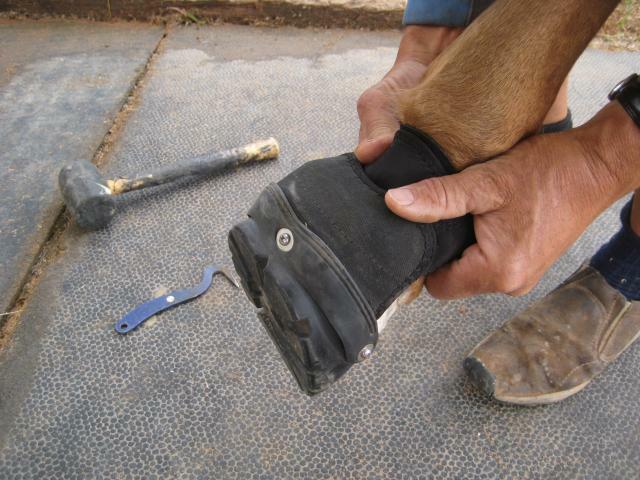 After you pull your Easyboot Gloves off the horse’s hooves, now is a good time to quickly tighten the screws that hold you gaiters to the shell. If you have used lock tite, then you would not need to do that. Many screws have been lost by riders forgetting this small, but important maintenance step.